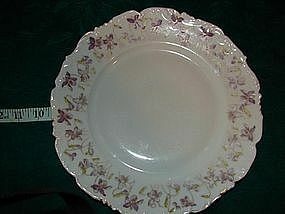 Tressemann & Vogt China. Plates are 9 1/2" in diameter. Scalloped edges in gold with beautiful violets spread over china. Circa 1892 to 1907. Pieces are backstamped T & V France in green, T.V inside of bell with France underneath, also a importers stamp of Nathan,Dohrmann San Francisco. The importers stamp indicates that they have to be pre-1903 because archives say that the importer company was destroyed in the 1903 San Fransisco earthquake. Some of the pieces show some wear to the gold trim, and a few pieces have a very small chip barely detectable. Over all these are in very good condition, especially being over 100 years old. I bet you won't find many of these for sale anywhere.